Your Halloween party guests will love when you serve them this unique spiderweb cocktail. Decorate their martini with a spiderweb for delicious spooky fun! Fill a cocktail shaker with ice and pour the liqueur, and cream overtop. Give the whole thing a good shake and then strain into your highball glasses. Using a black gel pen (the kind used for cakes), make three circles in the top of the drink - each one fitting inside the one before, like a target circle. Take a toothpick and place it in the center of the smallest circle. Drag it out to the edge of the glass, and then repeat, forming a web pattern. 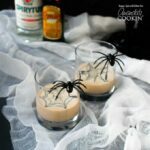 This recipe for Spiderweb in Cream Martini was printed from AmandasCookin.com - https://amandascookin.com/spiderweb-cocktail-halloween-drinks/ and can only be printed for education or personal use.